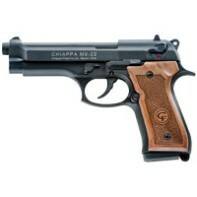 Perfect for training or just for shooting fun, the Chiappa M9-22 is an accurate facsimile of the current M9 U.S. Service pistol but chambered in .22lr. The weight and feel mimic the original, including the famous open slide design and the control as the magazine release and slide mounted de-cocker. The Standard models come with checkered black plastic grips and the Wood model comes with textured wood grip panels. Both M9-22s feature a 5.2” barrel, weigh 2.3 lbs and come with two 10 round magazines.